The first time I ate shrimp fried rice was when I had lunch in a Chinese restaurant with my girlfriend who eventually became my wife. Take hold of your seats, but that was when I met her in the 9th grade around 1962! And here is another fact; we have been married since 1969! But, that is another story. Of course, shrimp fried rice was made (and is still made) with real rice and unhealthy fats. Now, I make it with cauliflower rice and healthy oil. Actually, it is awesome. Chop mushrooms, carrots, onion, garlic, and sauté in saucepan with coconut oil covered over low heat until soft (approx. 10 – 15 minutes). Add coconut aminos and stir uncovered until thickens on medium heat. In another large skillet, heat coconut oil, add the cauliflower, and stir until slightly brown. Add mushroom, carrots, onions, and garlic mixture to cauliflower rice and combine completely in skillet, which is still on medium heat. Make a small circle in the middle of the pan. Drop the eggs into the circle and leave for about a minute until starting to cook. Scramble the egg into the rest of the mixture. Add cooked “Perfect Shrimp” (see below), stir, serve immediately. Place about 4-cups of water in a pot with 2 tablespoons of Old Bay Seasoning and bring to a boil. Then add 1-pound raw, peeled shrimp just until the flesh becomes opaque (no more than 1-2 minutes). Immediately remove from stove and pour through a strainer disposing of the liquid. 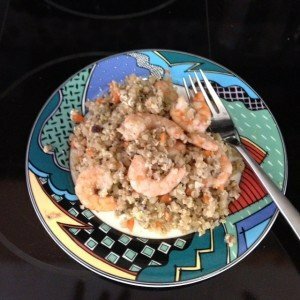 Tags > Alvin Danenberg, my favorite paleo recipes, shrimp fried "rice"